Many career sessions involve trying to understand what gives you energy. What do you enjoy doing irrespective of whether you are being paid for it. These are typically labeled skills or talents or strengths. Sometimes the career coach will then interview the client’s friends and colleagues to get a more complete perspective. They will hear that you are also really good at some other things that you don’t enjoy. Most of us get confused about activities that we have had a lot of experience. These are ones that we might have accumulated years of experience and we get praised accordingly either verbally or in our performance appraisal. But that doesn’t mean that we like doing these things. The chart is relatively straight-forward and one good way to think about this stuff . In the top-right you have your Realized Strengths. These are the things that energize you, that you are good at, and that you get to do frequently. 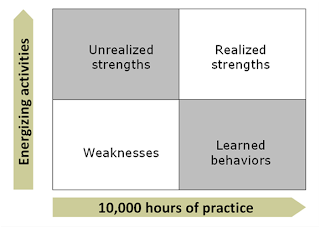 In the top left you have your Unrealized Strengths. These are the things that energies you, that you are good at, and that you may not get to do very often. They are by definition hard to identify because you have had less experience using them. In this quadrant lies huge amount of personal opportunity. In the bottom right, you have Learned Behaviors. These are the things that you are good at, but that drain you when you are doing them. For me this is project planning. Sometimes they are necessary evils. Other times they are the primary way that you are earning your living. Overly focusing on this quadrant is the cause of most people’s unhappiness in the modern workplace. In the bottom left, you have your weaknesses. You are neither good at these, nor do they give you energy. These are best avoided at all costs. Which of these five most applies to you? What’s your plan to overcome them?